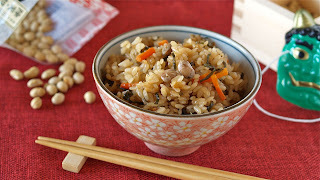 I cooked flavored rice using the lucky beans which was leftover from the bean scattering on Setsubun (2/3). You can use frozen Edamame beans, green peas, or any kind of cooked beans instead of Fukumame! 1. Wash rice if needed. If you are using pre-washed rice (musenmai) you don't have to wash it. 2. Place the rice in a pot and add water to the appropriate level indicated in the pot. 3. Add A and mix well. Place the pot into the rice cooker. Cover it, and press the button to start. 4. When it's done, do not open and let it steam for about 15 minutes. Using a rice paddle, toss the rice lightly. 5. Serve in a rice bowl.